The first day of our tour, we meet and Pune Airport and Fly to Aizawl. Welcome to Aizawl, the capital of Mizoram. A little free time to soak in awe of the city. We have a short Meet n’ Greet session before dinner. Today you explore the city. There are plenty of attractions in Aizawl like the Solomon's Temple, the Mizoram State Museum and the Bara Bazaar. The steep Zion Street is lined with stalls selling garments. The main bazar is where the people are best seen in their traditional costumes selling produce from the farms as well as imports from China brought through Myanmar. The Millennium Centre in the same locality is a popular shopping mall. Overnight in hotel. Today we proceed to the town of Kumarghat. It is purely a logistical stop. Post breakfast, you proceed to Agartala, the capital of Tripura and the 2nd largest city in Northeast India after Guwahati. Agartala is a derivative of two words, namely Agar, a valuable perfume and incense tree of genus Aquilaria, and the suffix Tala, meaning underneath, a reference to the density of Agarwood trees in the region. Some free time in the evening to explore the nearby city. Overnight in Hotel. Today you explore the city of Agartala. We visit Ujjayanta Palace built in Indo-Saracenic architecture, Neermahal Palace & the Tripura Sundari Temple. After the city tour, we catch the Rajdhani to Guwahati for our overnight train travel. 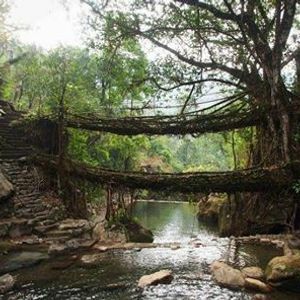 You will be picked up at the railway station and then drive to Shillong (3 hours), the capital of the state of Meghalaya and home to the Khasi tribe. Shillong has rightly earned the sobriquet of "Scotland of the East" owing to the rolling hills, beautiful scenery and climate. On the way you will visit the beautiful Umiam Lake, a major tourist attraction located just before entering Shillong, you can visit the local market and visit Don Bosco Monument which is a 7 storey monument where you can have a glimpse of culture and tradition of North-East, Ward’s Lake where you can enjoy boating, Botanical Garden and Lady Hydri Park. Check-in the Hotel and rest of the day in leisure. waterfalls, most importantly the Nohkalikai or Seven Sisters Falls, a seven segmented waterfall which falls from a height of over a 1000 ft, you can also some of the caves like Mawsmai Cave, Arwah Cave and drive to Shillong. Overnight stay at Shillong. In the morning after breakfast drive to Guwahati, the gateway of North-East. Then visit Maa Kamakhya Temple which is one of the famous Shakti peethas located at the top of Nilachal Hills from where you can have an eagle eye view of the whole city. Then you can visit Umananda Temple which is located on the smallest river island in Asia. Then in the evening, you can visit the local market or the Brahmaputra River Cruise. Overnight stay at Guwahati. In the morning after breakfast drive to Bomdila. On the way, you can have a beautiful view of the mighty Brahmaputra river over the Kolia Bhumura Bridge (Photography is not allowed there). Go for a visit to Bomdila viewpoint. Overnight stay at Bomdila. After breakfast transfer to Tawang. On the way visit war cemetery. Continue with the drive till you reach Sela Pass at an altitude of 4114m / 13494 ft. It is famous for high altitude lakes & scenic beauty & is ideal for ice skating during winter. Check in the hotel on arrival. After breakfast visit Tawang Monastery, Singar Ani Gompa. Evening return back to the hotel. Check in the hotel on arrival. After lunch visit Gontse Rabgyaling Monastery (Upper Gonpa), Thub-Chog Gatsel Ling Monastery (Lower Gonpa), Bomdila View Point. Bomdila offers a wonderful panoramic view of Himalayan landscapes and snow clad ranges. Evening you can visit the local market. Overnight stay in Bomdila. After Breakfast drive to Kaziranga, Famous for one horn Rhino. In the evening relax in the resort. Overnight stay at Kaziranga. Early morning go for Jeep safari the usual sightings at the park are of rhinos, elephants, deer, Asiatic buffaloes, Sambars, boars and a wide variety of birds, including migratory birds. Then after breakfast, you can go for local sightseeing like orchid Garden visit and Tea Estate visit. Overnight stay at Kaziranga. Early morning after breakfast drive to Majuli, it is the first River Island in India which was declared a district in Assam. Here you can visit different sattra’s. Then drive to Jorhat. Overnight stay at Jorhat. Early morning after breakfast drive to Kohima. 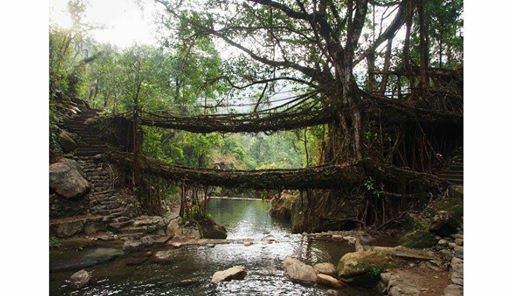 On the way, if time permits visit triple falls and then reach Kohima and overnight stay at Kohima. Early morning after breakfast, a little sightseeing at Kohima after which, you drive to Imphal. Go for a visit to Manipur State Museum. Rest of the evening relax in the hotel. Overnight stay at Imphal. Early morning after breakfast visit Kangla Fort, a symbol of Manipur’s glory where kangla means Land of Dryland. Then visit Imphal war Cemetery, Shri Govindji Temple and Imphal valley. Overnight stay at Imphal. Early morning after breakfast drive to Moreh famous for its rich culture and landscape. It is also known as the gateway to South-east. You can also take a walk to the Myanmar border (market area). Then drive to Loktak lake, it is the largest freshwater lake in Northeast India and is famous for the phumdis floating over it. Overnight stay at Loktak.